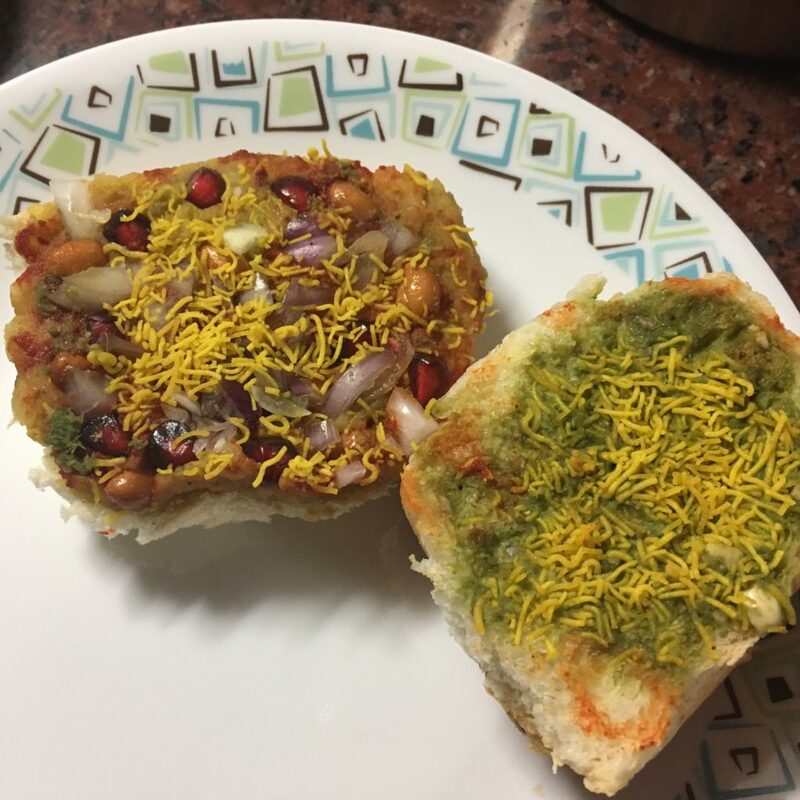 Dabeli is a famous street food, originating in the Kutch region of Gujarat. 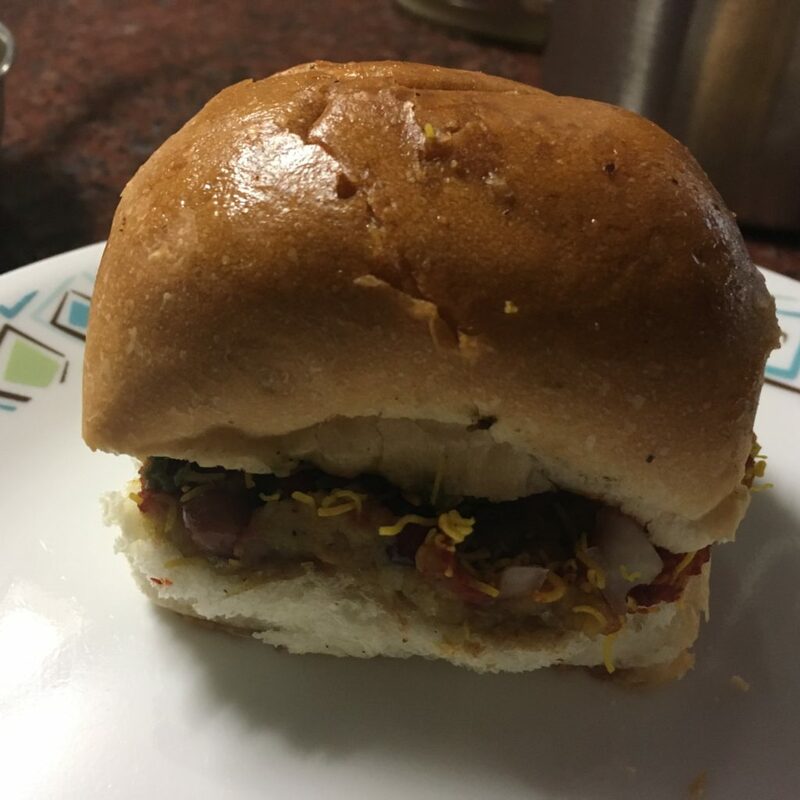 It's also known as Kutchi Dabeli for obvious reasons and sometimes as Double Roti. The term 'Dabeli' literally means pressed in Gujarati. The delicious filling is pressed between the two sides of the pav and is toasted in (Amul) butter to give that wonderful taste. Dabeli masala - 2 teaspoons or slightly more to your liking. Dry roast all the above ingredients for 2-3 minutes. Grind to a fine powder and store in an air-tight container. Take a handful of coriander leaves, 2-3 garlic pods, 1 inch ginger, 2-3 green chillies, 1 tsp peanuts (for consistency), a tsp of lemon juice and salt to taste. Grind it to a smooth paste using little water. Adjust the consistency and condiments to your liking. 8-10 peeled garlic pods and a big handful of red Kashmiri chillies. Soak the chillies in warm water for around 30 minutes and then grind the chillies with the garlic and some salt to a fine paste. Adjust water as per the consistency desired. Note: do not deseed the chillies. Take a cup of soaked and deseeded dates; to it add 2-3 tblsp of thick tamarind pulp, 1 tsp cumin powder, and rock salt to taste. Grind it to a smooth paste using water. Add more tamarind or dates/jaggery as per your liking. Heat oil in a pan and add cumin seeds to it. To it add the mashed potato, dabeli masala, 2 teaspoonful of tamarind-date chutney and salt as per taste. Mix well and the filling is ready! Do adjust the additions of masala, or chutney as per your liking. Slit the pavs and keep them ready. Next, apply the date-tamarind chutney to one side of the pav and the green coriander chutney to the other side. Press a big spoonful of the potato mixture on one pav. On it, add some chilli-garlic chutney and spread. Add pomegranate pearls, chopped onions, masala peanuts on the potato mixture and press it a bit. Add sev on it and cover it with the other side of the pav. Again, press it firmly and toast it on a griddle on both sides with oodles of butter!